You finally get that new label printer for your shipping department and you start reading the manual. 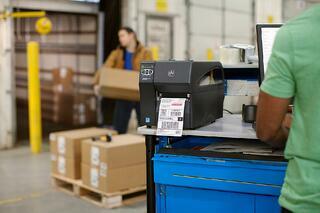 You new printer is ideal for printing labels with bar codes and high-quality images. That's great. Hmmm... it prints in both thermal-transfer and direct thermal modes. Most modern tabletop labels printers like those from Zebra, Datamax, Sato and others are able to print in thermal-transfer and direct thermal modes. But there is a big difference in how this is accomplished and why you would use one or the other. Let's look at them. When you send information for label content to your printer, it is sent to the print head which heats up in specific areas to create the image. These areas are basically microscopic dots that create words, images, etc. Printers are rated in dots per inch, usually 203, 300 or 600 dpi. But here is where things begin to differ. With thermal transfer printing, the print head heats up and transfers it's heat to a wax , wax/resin, or pure resin ribbon that is threaded over the print head. The ribbon melts in the specific areas to create an image and is pressed onto the label as it passes through the printer. The ribbon ink cools on the label and you have a clean, clear image of your information on a label. Thermal-transfer labels are coated paper or film with an adhesive backing to make them adhere to your product or package. If you are using the direct thermal method of label printing, you would start out by loading direct thermal labels. These labels don't require a ribbon to create the image because the label material is coated with a special top coat that is sensitive to heat. When you send a print job on a direct thermal printer, the print head heats up and transfers that heat to specific areas of the label. These areas turn black from the heat, thus creating your information. So which one should I use?? 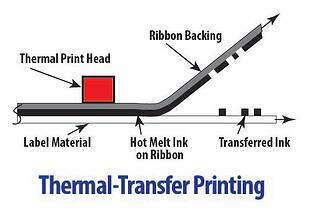 Thermal transfer printing allows the ink from the ribbon to melt onto the label which absorbs it. This makes the label more durable and very legible. The label durability increases depending on the type of ribbon you use (wax, wax/resin, or pure resin). You have to be careful to match the label material and ribbon to ensure you get the best performance. You can get archival-quality labels that will withstand extremes in temperature, light exposure, liquids, abrasion and more if you choose the best combination. Typical applications for thermal-transfer printing includes wrist bands, product identification, circuit board tracking, asset tagging, inventory identification, UL/CSA labels, cold storage labels and even outdoor applications. Printed bar codes are usually superior and the labels are fade-proof compared to direct thermal. Direct thermal label printing doesn't require a ribbon so there is a cost savings right away. If you are printing millions of variable information labels like address labels, this is the way to go. The printers cost less to operate than ink jet, laser or impact printers. The only issue with direct thermal labeling is that the images may fade over time. If the label is exposed to heat, bright light or other environmental conditions, it might darken to the point that the text and images are unreadable. Because of this, direct thermal labels are not used for lifetime identification purposes. Temporary labels and other applications like one-day wristbands, food receipts, shipping labels, pick tickets, name tags and other quick-use labels work well. Many large scale distribution centers and shippers (think UPS/Fed Ex/Amazon) use shipping labels that are direct thermal. They are hardy enough to last the few days that a package is in transit while keeping costs to a minimum. The best way to decide which printing method to use would be to analyze your situation. 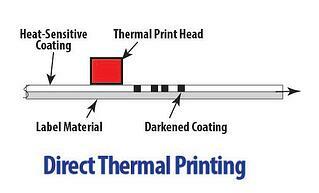 If you are just creating shipping labels that have to last a few days, direct thermal is the way to go. But if you need labels to last a while and have clear, perfectly readable bar codes, you might want to go with thermal-transfer labels. 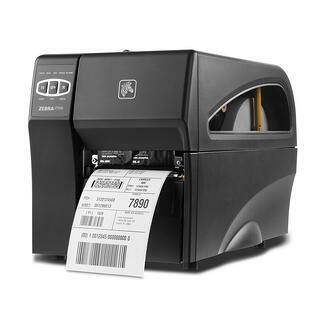 If you need more information or want to see pricing on thermal-transfer label printers, ribbons, and labels, check out www.go-label.com. They have great deals on all the things you need to get started or replace your aging label printer.